The SNCF 141 R is a class of 2-8-2 steam locomotives of the Société Nationale des Chemins de fer Français (French State Railways). They were used all over the French rail network from 1945–1974. At the end of World War II, there was a shortage of locomotives, and to quickly obtain the large number needed locomotives were ordered from the main American and Canadian locomotive builders under the Lend-Lease Program (and not the Marshall Plan, signed in April 1948, as often written). The design was based on the Green Bay & Western Railroad's successfully customised Mikados, based somewhat on the USRA Light Mikado, suitably modified to meet the SNCF loading gauge. Modifications included the overall height, the fitting of European couplers and buffers, left-hand drive, smoke deflectors (to a unique and instantly recognisable style) and a Kylchap exhaust on the second batch. The first order for 700 engines was placed in February 1945 with production split between the "big three" American locomotive builders: Baldwin Locomotive Works, Philadelphia, Pennsylvania, American Locomotive Company, Schenectady, New York, and Lima Locomotive Works, Lima, Ohio. 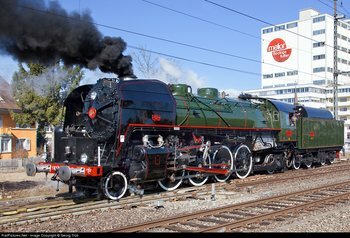 Once financing was made available, the second batch of 640 engines was ordered from the "big three", plus the Canadian manufacturers Montreal Locomotive Works, Montreal Quebec and Canadian Locomotive Company, Kingston, Ontario. Most of this batch were built as oil burners, burning preheated heavy fuel oil (known in French as 'Mazout'), unlike the first batch which had all been designed as coal fired. The massive introduction of oil fired locomotives was due to the fact that in the immediate post-war period, the quality coal was in high demand and SNCF was consuming 9 million tons per annum. Oil thus allowed savings in coal, even if in many depots it required a revolution in working conditions. The extra range permitted by oil—700 km (435 mi) instead of 400 km (250 mi)—explains also the more intensive use of the locomotives. The enginemen nicknamed the locomotives mazoutières or charbonnières ("coal-scuttles") according to fuel employed; oil-burners were also called les goudronneuses ("tar spraying machines") by their crews. Author:Barry T Gaskin using Fred Miller's SPJHelper and Digitrax SoundLoader. Each engine we have recorded has a distinct 'personality', so a particular locomotive example may sound slightly different due to unique e.g. tappet, crank-rate shell vibrations and exhaust-stack, chuff differences. Horns and bells are often moved between locomotives.